Julia Ennen as Daisy and Anna Larranaga as Violet in The Chameleon Theatre Circle’s 2017 production of Side Show, which opened to packed houses at the Ames Center for the Performing Arts shortly after a future booking controversy became public. Photo by Daniel K. McDermott for Sinséar Video + Photography. The Chameleon Theatre Circle made headlines this spring when the company announced on March 25 that it was ending a 9-year residency at the Ames Center for the Performing Arts over the title of a play. This event provoked an extended debate about public vs. private support for the arts, word-based censorship and obscenity, and differences in urban vs. suburban theatre diets. It also raised a question about where the 19-year-old company would hang its thespian masks next. Lee Blessing’s play Independence at the Bloomington Center for the Arts (Oct. 27-Nov. 12, 2017). Benny Andersson, Bjorn Ulvaeus, and Tim Rice’s musical Chess at Gremlin Theatre in St. Paul (Dec. 1-17, 2017). Steve Martin’s play Picasso at the Lapin Agile at Gremlin Theatre (Feb. 9-18, 2018). Howard Ashman and Alan Menken’s musical Little Shop of Horrors at the Sabes Jewish Community Center in St. Louis Park (April 13-29, 2018). Duck Washington’s Caucasian-Aggressive Pandas and Other Mulatto Tales at the Bloomington Center for the Arts (June 8-24, 2018). A file photo of Chameleon Theatre Circle’s cast for its 100th production, The Rocky Horror Picture Show. 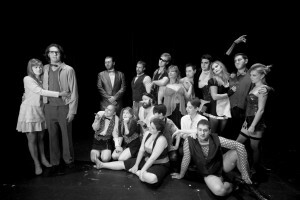 In an April interview, Chameleon’s Executive Producer Andrew Troth stated, “Chameleon has always sought to produce shows that are exciting and thought-provoking for artists and audiences, in an eclectic mix of styles and genres, and frequently including new work.” In its return to a more nomadic season, the company is revisiting some old hits: Chess, Picasso at the Lapin Agile, and Little Shop of Horrors have all been produced by Chameleon in previous seasons. Caucasian-Aggressive Pandas and Other Mulatto Tales, the play whose title spawned the dispute leading to the theatre company’s departure from the Ames Center, will be produced by Chameleon in conjunction with Fearless Comedy Productions. The play was written by biracial playwright Duck Washington and has been produced in the area twice in recent years. Some of the controversy about this play’s previously proposed production at the Ames Center involves the word “mulatto”, which is considered a highly offensive racial slur in some circles and a neutral technical term in others. (Compare, for example, the contentious history and “reclamation” of “the N word”.) Who is “allowed” to use the word in polite conversation is a matter of frequent Internet debate, sometimes involving the current Presidential administration. This debate also intersects with issues of authors’ rights and creative control, as well as to what extent different rules apply for public vs. private facilities. Washington rejected a request to alter or censor the title – a common practical expedient for example stagings of what is usually billed as The Motherf**er with the Hat, for example – arguing that it would intrinsically alter the work.